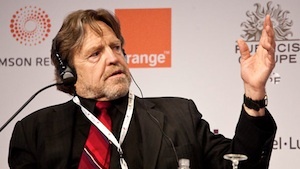 The copyright concerns of big business were on display at the economic-G8 conference in Paris on May 24th, 2011, when Grateful Dead lyricist and copyright activist John Perry Barlow offered a challenge to the politicians and plutocrats. Barlow was the only one to question the assertion that the Internet needs more regulation. After listening to French President Nicolas Sarkozy call repeatedly for Internet regulation and more copyright protection ("economic solutions to economic problems"), Barlow took on the industry/government representatives. According to this May 25th 2011 report in arstechnica, Barlow challenged the entire notion of "intellectual property: "I may be one of very few people in this room who actually makes his living personally by creating what these gentlemen are pleased to call "intellectual property." I don't regard my expression as a form of property. Property is something that can be taken from me." The head of Universal Music France then challenged Barlow with an economic argument: Didn't Barlow understand just how much money was necessary to nurture new talent? "If you're spending $5 billion on new artists, we're not getting our money's worth," Barlow replied. Barlow then argued that payment comes from building a product that people actually want to buy — not from further incentivizing the large institutions that prey on the creators. In Barlow's view: "The movie industry's repeated record box office takes in recent years show that people have no problem coughing up the cash for something of value" but further regulating the web isn't going to increase creativity. Thanks to film marketing and publicity whiz Sheri Candler for finding these clips.